22 March 2010: There are estimated to be 15 to 20 million Muslims living in the European Union (EU); this population is expected to double by 2025. Muslims in Europe are a diverse population of citizens, as well as newly arrived migrants. Most live in capital cities and large industrial towns. Though the majority of Muslims are a long-standing and integral part of the fabric of their cities, many experience discrimination and social and economic disadvantages. Muslims in Europe today are also under heightened suspicion and scrutiny. This complex situation presents Europe with one of its greatest challenges: how to effectively ensure equal rights and social cohesion in a climate of political tension, economic uncertainty and rapidly expanding diversity, says the report Muslims in Europe by the Open Society Institute (OSI). There is very little data available on Europe’s Muslim and minority populations. What does exist is extrapolated from ethnic and country-of-origin data, which provides a limited picture of the lives, experiences and needs of Muslims in Europe. The increasingly visible ethnic, religious and cultural diversity of Western Europe has triggered debates on social cohesion and integration. Muslims are often at the centre of these debates. Policies to support integration and promote cohesion are developed at the European, national and local levels. The EU defines integration as a two-way mutual process. The report Muslims in Europe focuses on public policies at city level, in the context of national and European interpretations of the concept of integration, and how they are played out in the everyday lives of Muslims and non-Muslims across Europe. On the whole, people from different backgrounds in the 11 cities (Amsterdam, Antwerp, Berlin, Copenhagen, Hamburg, Leicester, London, Marseille, Paris, Rotterdam and Stockholm) studied by the Open Society Institute said they got along well together and were willing to help each other. Yet, though both Muslims and non-Muslims believed that similar values were an important part of belonging to a country, the majority did not believe that people in their own neighbourhoods shared similar values. Muslims identified respect for religion as a more important national value than did non-Muslims. These results present a complex picture, suggesting that a sense of shared values is not as necessary for people from different backgrounds as trust and a willingness to help neighbours. For Muslims, feelings of belonging to their neighbourhood and city are stronger than belonging to the nation. For non-Muslims, national belonging is greater than (or the same as) city or community belonging. Half of Muslims who identified culturally with their country (i.e. saw themselves as Belgian, French, Dutch, etc.) did not feel that others viewed them in the same way. Cultural identification increased with integration in other areas such as employment and education. Muslims with a visible religious identity did not differ from other Muslims in their sense of cultural identification, belonging, or levels of trust. The OSI research suggests that religious discrimination against Muslims remains a critical barrier to full and equal participation in society. The findings of this report are consistent with other research and suggest that levels of religious discrimination directed towards Muslims are widespread and have increased in the past five years. European-born Muslims, particularly women, were more likely to perceive higher levels of religious discrimination than Muslims born abroad. European-born Muslim men identify the police as a key source of unfair treatment and discrimination. For Muslims, the persistence of discrimination and prejudice affects their sense of national belonging. OSI reports significant levels of interaction between people from different backgrounds, with European-born Muslims reporting the most. Frequent contact occurred at work, schools, shops, in public spaces such as transport and parks, and (more surprisingly) in the home. The majority of European-born Muslim women (51 per cent) had frequent contact at home with people outside their ethnic group. The results run contrary to the view that Muslims live parallel or segregated lives, or do not feel a sense of belonging or attachment to the city and country where they live. It suggests that discrimination remains an important barrier to belonging, but one that many are overcoming. The picture on educational attainment for minorities is mixed. In some countries, once socioeconomic background is taken into account, minorities are doing well. For some Muslims, religion plays an important role in supporting and encouraging education. Parental support, particularly in the early years, is also a strong predictor of future educational attainment. Across all cities, there is increasing recognition of the importance of pre-school education in ensuring that pupils from minority and other disadvantaged backgrounds do not start formal schooling under-prepared. There is also growing evidence that education systems which place pupils into different education streams too early are disadvantaging young people from minority groups, who need more time to develop the linguistic skills to excel in education. 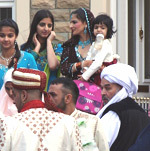 A desire for more ethnically mixed schools emerged consistently and strongly in the focus group discussions involving Muslim parents across the different cities. Parents were anxious about the adverse impact of segregation on their children’s education and future prospects. Policymakers must find ways to overcome segregation, ways that result from a mixture of residential settlement patterns and parental and school choices. Some Muslim pupils continue to suffer racism and prejudice at schools and are confronted by low expectations from teachers. Teachers need appropriate training and support to ensure that they can be effective in classrooms that are increasingly diverse, both ethnically and religiously. At the local level, many schools are responding positively to the needs of Muslim pupils, finding imaginative ways to work positively with their cultural heritage. The settlement patterns of the majority of Muslims in the 11 cities in the OSI survey reflect the nature of the migration process in their country. Workers and their families mostly settled in the poorer districts of large industrial cities. This geographical concentration produced networks of support and the development of goods and services to meet cultural needs. The OSI survey, however, shows that most Muslims want to live in mixed communities, challenging the claims that the geographical concentration of Muslims reflects their desire to live among their own kind. Discrimination in housing confronts many Muslims and restricts their choices. Policymakers must find ways to maintain areas that are ethnically and religiously mixed, and to ensure that Muslims are able to choose where to live in a city unrestrained by discrimination and prejudice. Muslims are not integrated into the mainstream labour market. They face higher unemployment rates and higher poverty rates than the general population. Those who are employed are often in marginal and low-paid jobs, this carries a greater risk of unemployment. Low-paid jobs also lead to segregated or parallel working lives. Human capital accounts for some of this disadvantage in employment. Other factors include the lack of social networks, knowledge about the labour market, and language fluency. Some Muslims, particularly women who wear the veil, face penalties in the labour market based both on their ethnicity and their religion. Muslim women are also influenced by cultural preferences regarding family and childcare. Across the 11 cities, different measures are being taken to provide support for labour market participation; these include working with Muslim communities to ensure that advice and information reaches those who are furthest from the labour market. Some cities, as major employers, are taking steps to ensure that their workforce reflects the full diversity of the local population. There are high levels of satisfaction in the health care that individuals receive. Reports of discrimination and unfair treatment are low and most respondents felt that doctors and health clinics respect the needs of people of different faiths. Nevertheless, accommodating the needs of Muslim patients  in particular, the provision of halal food and, where hospitals provide chaplaincy services, access to imams  remains an issue that needs to be addressed. The need for appropriate care services for first generation migrants who are growing older is an emerging issue of concern for many Muslims. Across the cities, there are examples of effective service delivery and provision that takes the cultural and religious needs of Muslims into account. It is critical to ensure the accurate reporting and recording of hate crimes. The high levels of trust in the police provide a good base from which to develop initiatives to improve reporting. However, it needs to be recognised that these overall high levels of trust exist alongside low levels of trust among young European-born Muslim men, who experience the greatest amount of discrimination and unfair treatment at the hands of the police. The situation in Marseille suggests that over time, even the most complex and fraught relations between the community and the police can improve. Some cities are developing imaginative ways to improve engagement with communities, as well as effective strategies for recruiting and retaining police officers from minority communities. The OSI report Muslims in Europe points towards some encouraging trends, as well as the persistent challenge to ensure political and civic participation for Muslims. Many Muslims who are not EU citizens remain disenfranchised, particularly in Germany and France, where they do not have the right to vote in local elections (even though many are long-term residents). Those who vote are more likely to feel that they can effect change in their city than those who do not. However, Muslim voters remain less likely than non-Muslim voters to feel that they can influence decisions affecting their city. Young Muslims, with more education and familiarity with political institutions, have greater confidence in their ability to effect local change than the older generations. Muslims are active in mainstream political parties. Parties based on ethnic and religious identity have not gained the support of Muslim voters. Increasing numbers of Muslims are standing for political office, but face additional scrutiny and questions because of their ethnic or religious background. Muslims and non-Muslims share similar views in relation to their level of trust in the city council and government. Trust in local political institutions is higher than national institutions. The difference between Muslims and non-Muslims in their levels of trust in Parliament is significant and should be of concern. The majority of Muslim and non-Muslim respondents are involved in mixed ethnic and religious organisations. The OSI research finds many positive initiatives taken by officials at the local level to engage with ethnic and religious organisations in their city. These initiatives may account for one striking finding from the OSI survey: respondents involved in same-ethnic/religion civic organisations are significantly more likely to trust their city councils than those involved in mixed organisations. In engaging with Muslim civil society organisations, policymakers and practitioners always need to ensure that they include women, young people, and others who may be marginalised by existing community organisations. The Open Society Institute’s At Home in Europe project is working to address issues through monitoring and advocacy activities that examine the position of Muslims and other minorities in Europe. One of the project’s key efforts is the series of reports on Muslim communities in the 11 EU cities of Amsterdam, Antwerp, Berlin, Copenhagen, Hamburg, Leicester, London, Marseille, Paris, Rotterdam, and Stockholm. The reports aim to increase understanding of the needs and aspirations of diverse Muslim communities by examining how public policies in selected cities have helped or hindered the political, social, and economic participation of Muslims. All 11 city reports, drafted by local experts, include detailed recommendations directed at specific local actors; these will form the basis for advocacy activities by the project and its partners. The overview report has recommendations at the international level that will touch all countries covered by the reports and be directed primarily at the European Union (EU) and other international organisations. The German office for migration and refugees found that there are between 3.8 million and 4.3 million Muslims living in Germany, making up about five per cent of the entire German population. It was previously estimated that there were between 3 million and 3.5 million Muslims living here. More than half of Muslims in Germany originate from Turkey. As many as 2.7 million Turkish people are living in Germany, making up more than three per cent of the population. Another 600,000 Muslim people come from south-eastern Europe and the Middle East. Just under half, or 45 per cent, of Muslim migrants are foreign-born but now hold a German passport. Yet when it comes to integration, there still deep deficits. Concerning education, Muslims were found to be particularly conservative, making integration of children difficult. Ten per cent of Muslim girls are kept home from school trips, another seven per cent are withdrawn from swimming lessons and 15 per cent are exempt from sexual education classes for religious reasons. However, more than three-quarters of those surveyed would welcome Islamic religion courses in the schools. The researchers found that integration in schools improved significantly with second generation Muslims, or those born in Germany. The majority of Muslims in Germany attend Mosque services “rarely to never”, while only a third go regularly. Only 30 per cent of Muslims here wear the politically-disputed head scarf, and usually pass the tradition down to their children. The German study questioned 6,004 people from originally 49 Muslim countries living in Germany about everything from origin to religion to integration - for themselves and their families, bringing the total number of people covered by the study to 17,000. 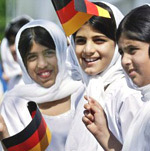 Almost all Muslims in Germany  98 per cent  live in the former western states and eastern parts of Berlin.